Remember that $9 or $20 cardboard bike that wowed everyone then disappeared? Yesterday on Twitter, Shane Snipes tipped us to an invite-only page announcing a Kickstarter and said he met the inventor at a social conference in NYC. Last month, I spotted the bike in a news item that came up for a museum exhibition about the art of the bicycle. At the time, I thought the bike was a well-done PR play by Izhar Gafn and an internet sensation that lit up all the design and tech blogs. 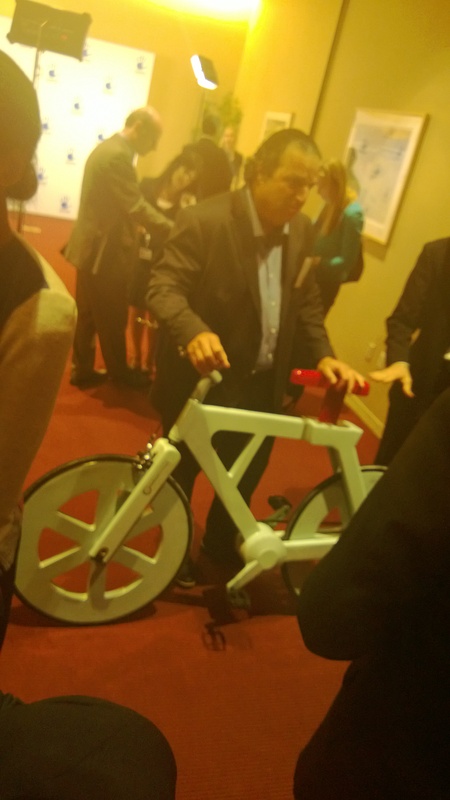 The plausibility of a cardboard bike was like any other design-student CAD project that’ll never get built. Now with an invite-only, pre-Kickstarter page, maybe it will? Carlton Reid also picked up the story. I’m still skeptical, but also interested in the applications of resin-coated, folded cardboard. Photo of Izhar Gafn by Shane Snipes.